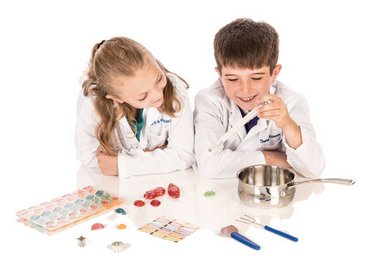 This edible science experiment kit for kids is fun, educational and yummy too. Science can be fun, science can be messy, and science can be sweet. Yes, I said sweet. Not every kid is a natural chemistry lover, but aren’t all kids natural treat lovers? The minute you mix science and sweets together you will be amazed at how your “do we have to do science” child can change into a “can we do that science experiment now” child. Best of all, it’s the perfect way to extend the Valentine’s Day love. Make some candy (in the name of science, of course), and then share it with the ones you love! Win-Win! 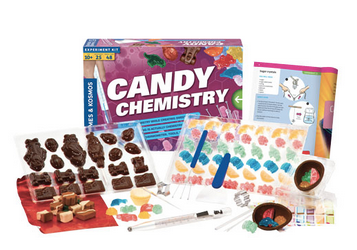 The Candy Chemistry Set from the at-home science experiment experts, Thames & Kosmos, is our top pic for sweet science experiments. The kit includes over 25 tasty experiments and has everything you and you’re young Einsteins need to make mouth-watering treats. Together you’ll explore the worlds of math, chemistry and physical science. Best of all, this kit receives rave reviews from kids and parents alike because it is fun, educational and easy to use. The one science experiment you can eat when you’re done! •Use this educational science kit to discover why sugar crystallizes to make rock candy. • Study the phases of matter and discover specific heat as you melt chocolates and pour them into molds. • Learn to use a thermometer as you cook hard candy from sugar. • Practice measuring and conversions. • Investigate the chemistry of gummy bears. Yum! As cool as this at home science experiment for kids is, it has one advantage few other science kits can claim. With this kit, you can eat your experiment when you are done! This kit is recommended for ages 10 and up. Check out all the other awesome science experiments for kids at jmcremps.com.